Want to get the lowdown on Dutch shopping chain stores present in Amsterdam? The city has its fair share of international brands as well as independent shops. In this guide we will overview a selection of the major Dutch shopping brands found on high streets in the Netherlands. De Bijenkorf (The Beehive) is the premium department store chain of the Netherlands, dating back originally to 1870. It is run by the same group that owns the UK’s Selfridges. 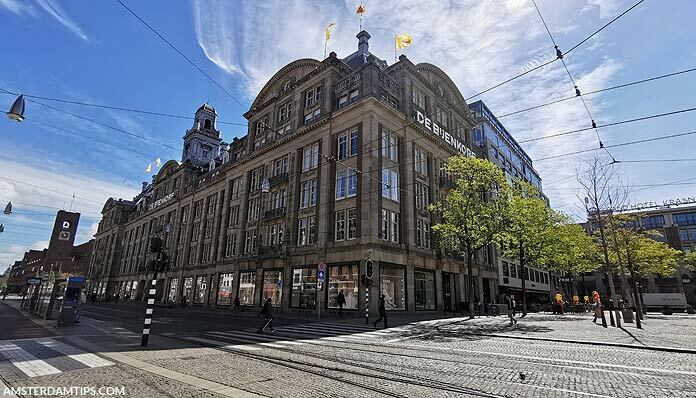 The flagship Bijenkorf store is the grand 6 floor branch located on Damrak/Dam Square in Amsterdam. It also has stores in many cities around the country including at nearby Amstelveen. Bijenkorf sells both own-label goods and brand names. On the ground floor of the Dam branch you will find perfumes, cosmetics, jewellery and watches. High-end fashion label stores such as Louis Vuitton, Hermès, Burberry and Gucci are present. Bijenkorf usually has quite creative window displays at ground level in Amsterdam, particularly over the Christmas period. Bijenkorf is an aspirational store for the Dutch middle classes and prices are on the higher side. Open 1000 Tue-Sat and 1100 Sun-Mon. Closing times can vary, either 2100 or 2200 (Tue-Sat) and 2100 (Sun-Mon). 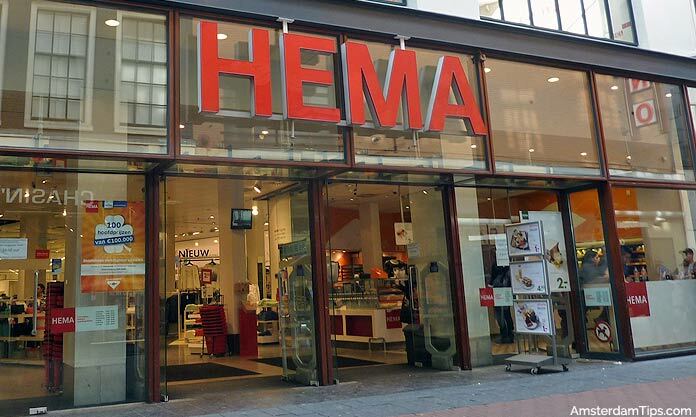 HEMA is a Dutch institution, a chain store which sells generic own brand goods at reasonable prices. First set-up in 1926, HEMA stands for Hollandsche Eenheidsprijzen Maatschappij Amsterdam or Dutch Standard Prices Company Amsterdam. With a unique position in the Dutch retail market, it could loosely be compared to the old Woolworth’s general stores. It sells a wide variety of goods to satisfy standard needs – from basic clothing and underwear, household items, hardware, cycle accessories, cards, stationary, vitamins and cosmetics. HEMA is about simple style, value and practicality. Larger HEMA stores have a small food section selling fruit and veg, meat, fish, bread, cheese, wines etc. Some stores include a café selling sandwiches, salads, hot meals, cakes and drinks. A cheap breakfast from €2 is available between 9 and 10am. It also has takeaway outlets famous for its rookworst smoked sausages. There are 17 store locations in Amsterdam including Kalverstraat, Nieuwendijk, Ferdinand Bol Straat and Kinkerstraat. There are a small HEMA stores at Amsterdam Central Station and Schiphol airport. You will find HEMA shops all over the Netherlands. HEMA is also branching out internationally with stores in Europe and the UK. Action is a popular discount Dutch retailer selling a varied assortment of products – from house and homeware, DIY and hardware items, office supplies, glassware, ceramics, textiles and toys. Prices are very low (cheaper then HEMA) and the quality of products is reasonable. Action has a number of stores around Amsterdam including at Europaboulevard, Delflandplein, Kinkerstraat, Nieuwpoortstraat, Pijnackerstraat, and Plein 40-45. Blokker is a Dutch hardware and homeware store found all over the country. It sells home and kitchenware, small electrical household appliances, some furniture and toys. The stores have recently undergone a restyling. Like many Dutch stores they produce a weekly folder, a leaflet-booklet publicising the latest offers and distributed to homes or available online. Blokker occasionally offers deals on 1 day NS train tickets as well. 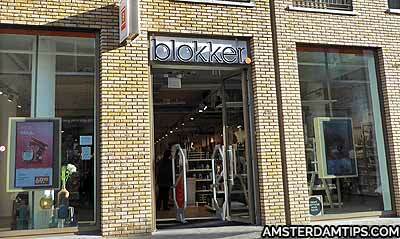 There are around 20 Blokker stores in Amsterdam including at Jodenbreestraat, Rozengracht, Haarlemmerdijk, Bilderdijkstraat, Kinkerstraat, Stadhouderskade and Ceintuurbaan. C&A is a discount clothing retailer. The company was started in the Netherlands in the 19th century and still retains Dutch ownership – it is familiar to British people, but pulled out of the UK market in 2001. C&A sells its own-branded clothes lines (such as Angelo Litrico, Canda, Clockhouse) and the quality of clothes has been improved over the last few years. However it faces stiff competition from the likes of the more trendy H&M, Zara and Primark, which has an Amsterdam store. C&A Amsterdam is located on Damrak / Nieuwendijk and shares the building with Primark. Previously known as De Tuinen (Dutch for “the Garden”), this is a health shop and chemist chain owned by Holland and Barrett in the UK, a subsidiary of LetterOne Group. It specialises in various cosmetics and personal care products, supplements, homeopathic remedies, herbal teas, gift packages, some “new-age” type items and a small range of health food. It sells both own-branded products and a variety of other brands such as Neal’s Yard and Weleda. There are 8 H&B stores in central Amsterdam including Kalverstraat (2 stores), Nieuwendijk, Leidsestraat, Utrechtsestraat, Kinkerstraat, Ferdinand Bolstraat and van Woustraat. It has shop locations all over the Netherlands. These are 2 very well known Dutch chemist chains. Etos is the premier brand selling personal care products, vitamins, over-the-counter medicines, cosmetics and perfumes. Kruidvat is a budget chemist chain with a similar line of goods and is often cheaper than Etos for branded items. Etos is the better presented shop as Kruidvat can be a little chaotic. If you are looking for Dutch liquorice (drop) then you can find it in either shop. Store locations all over Amsterdam including Nieuwendijk. Perry Sport is a Dutch sports shop chain selling sports clothes, exercise and sport equipment, travel and outdoor gear. It sells both brand names and cheaper own-label products such as Wildebeast. It is present in most major towns and cities in the Netherlands. Stores in Amsterdam are at Kalverstraat and Overtoom, with a large outlet at Amsterdam ArenA (Bijlmer). French competitor Decathlon also has a sport megastore at Amsterdam Bijlmer-ArenA. Xenos is a Dutch budget houseware chain store and a subsidiary of Blokker. It sells homeware, glassware, ceramics, basic furniture plus a small but varied assortment of international food items. Central Amsterdam stores can be found on Kalverstraat and Bilderdijkstraat – with other stores in the suburbs and all over the Netherlands. Xenos has also expanded into Germany. Zeeman is a Dutch textile and clothing retailer offering discount prices. It sells basic clothing, home textiles (towels/bedding), wool and toys. Various locations in Amsterdam include Albert Cuypstraat, Jodenbreestraat, Kinkerstraat, Rijnstraat and Spaarndammerstraat.